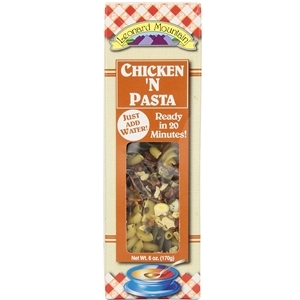 Leonard Mountain Chicken 'N Pasta Soup Mix is an ideal mix for anyone who wants the goodness of Mom's chicken noodle soup, but doesn't have the time! Available boxed (as shown) or in a clear decorative bag that includes 25% more mix (8 servings versus 6) and is great for gifts. Add water and salt to pot and bring to a boil. Add seasoning packet and stir until there are no lumps. Add noodles and reduce heat to medium. Cook until noodles are tender - usually about 8-10 minutes. Add additional water for desired consistancy. Optional: add chicken and/or fresh vegetables. Tri-colored noodles, chopped onions, parsley, carrots, celery, peas, tomato flakes, red bell peppers and good seasonings.